​EcosystemOS offers common user accounts and API's with documentation for user data portability, API connections, data models and data sharing principles to develop applications for startup ecosystems. It also includes a marketplace for connected ecosystem applications and third party API functions. ​EcosystemOS is especially used by public sector organizations (e.g. regional and municipal development agencies), corporations driving dedicated business vertical ecosystems internationally for innovation and private startup services that operate startup and entrepreneurship ecosystems and offer services to startups, investors, and other stakeholders. Open Documentation for API connections, data models, data sharing and data portability principles. 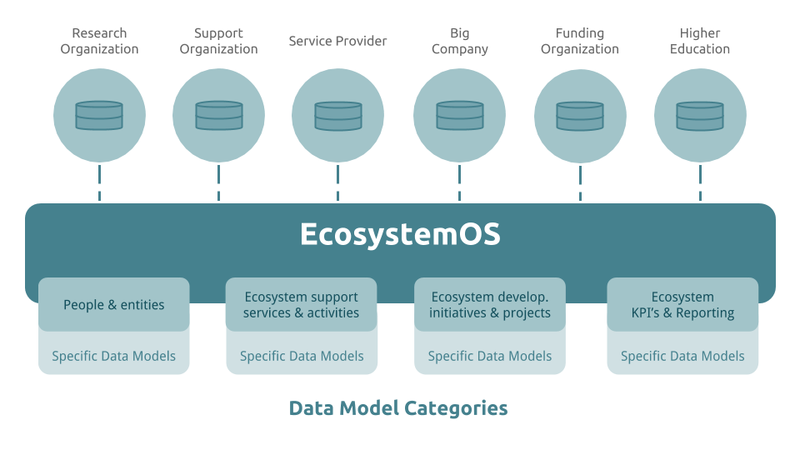 "EcosystemOS is built specifically for entrepreneurship, innovation and startup ecosystems to connect ecosystem management applications and tools with other ecosystem key application by startup commons and local and global third parties." API’s to allow full freedom of front-end design and build without losing the benefits of the shared startup ecosystem architecture. ​Once data is enabled to flow more freely, existing applications can start to be enhanced and developed to tap into ecosystem level shared data, without forcing and training users to change applications they already know how to use. Also, entirely new type of applications and functions can be developed to start solving the ecosystem level problems. Applications that are based on shared data from the ecosystem or even from other ecosystems. ​National and local EcosystemOS operators have key operative role in their selected markets following these same principals, while Startup Commons focus on global facilitation standardization and promoting connected applications. Ecosystem Operator model have many similarities with mobile telecommunications, where mobile operators focus on local network and services development and network technology providers focus on developing network technology, operating solutions as well as collaboratively work developing network standards to enable international roaming.